Built in 1907, the Plaza Hotel is a treasured New York City landmark. It is the setting for the famous “Eloise” books, several films and has, over the decades, hosted eminent guests from the worlds of entertainment, politics and culture. The Plaza was closed in 2005 in order to undergo a multi-million dollar renovation and re-opened in March, 2008 with its old-world luxury and elegance complemented by state-of-the-art technology. The property offers 282 hotel rooms and 167 private condo hotel units and is managed by Fairmont Hotels and Resorts. Implement a key control system that could accommodate the new plastic key cards as well as hard keys and allow the staff to have controlled access to the keys as required by their job functions. The system programming for accessing and returning keys needed to be flexible so that several different groups could be accommodated. In addition, a quick and easy audit trail was required so that any allegations of impropriety could be immediately addressed. Prior to the renovations, the Plaza Hotel utilized hard keys for guest room access. Plastic key card technology was implemented as part of the renovation. While the individual guest room door locks can now be “interrogated” for their access history, it is still necessary to secure and control the security keys used by the staff to access the guest rooms and also for management to be able to interrogate the key control system for its access history. Because so many of the hotel staff may be required to enter a guest room (i.e. housekeeping, in-room dining, butler service, amenity waiters, etc. ), programming of the system needs to accommodate up to eight different groups, working around the clock. Certain groups only have access to certain keys; some require fingerprint identification access and others require numerical code access. Additionally, management needs to be notified immediately if a key is not returned within the programmed parameters as well as who may have returned a damaged key. KeyWatcher® Key Control System — The KeyWatcher is a custom configured solution that allows the Plaza to maintain key integrity and key control. It automatically records the access history of each key, including user, date and time of key access/ return. The system releases assigned keys only to users with the proper authorization code (either fingerprint identification or numerical code), and cannot be manipulated or easily tampered with. The illuminated key slots make accessing and returning keys easier and the system as configured readily accommodates both hard keys and plastic key cards. KeyPro® Performance Software – The userfriendly PC application software delivers real-time transaction polling, key status, alarm and reporting capabilities for the KeyWatcher system. Activity reports can be customized to trace key movements by time, date and user code or biometric access data. And because the software allows the KeyWatcher Key Control System to be conveniently accessed and programmed remotely via an IP connection, control of the keys can be more efficiently and safely managed remotely as well. Priority email alerts can be sent to management to keep them informed of the whereabouts of high security keys or if they have been logged out for too long. 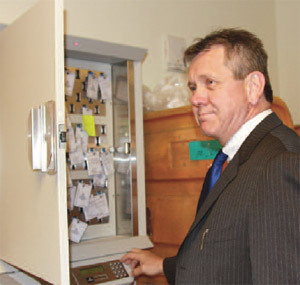 The KeyWatcher system installed at the Plaza Hotel is used for controlling approximately 100 keys, the majority of which are key cards used by staff for guest room entrance. Using the The KeyPro Performance Software, hotel security management is able to program access to the keys for each of the eight different groups, allowing for overtime and for unscheduled work hours. The software also generates reports which provide accurate and detailed information, such as which employees accessed the keys, when they accessed them and when they were returned and notifies management if keys are not returned after a certain amount of time. The KeyWatcher system has allowed the Plaza Hotel security management team to maintain control and integrity of plastic key cards used for guest room access in addition to their hard keys. Transaction reports are generated two-three times a week, but at any time the system can be queried as to which keys are out and who has them. This capability speeds up the process of monitoring and auditing key transactions and, in the event of an allegation of impropriety, the quickly produced information helps to resolve situations in a more timely manner. Learn more about our key control solutions for hotels and hospitality.